The Lacombe breed is the fifth ranking breed of swine in Canada; 1,743 were registered in 1981, of which 648 were boars and 1,095 were females. The breed is medium sized, white, has large drooping ears, is long bodied, rather short of leg, and quite meaty in conformation. The breed has been especially selected and noted for its rapidity of gain and docility, especially the sows. There has been much attention paid to litter size, weaning weight, growth rate, efficiency of feed conversion, carcass quality and physical soundness. The breeding program that founded the breed was conducted at the Canadian Department of Agriculture Research Station at Lacombe, Alberta, and was under the direction of Dr. J. G. Stothart and Dr. H. T. Fredeen. The breed was hence named after the location of the station. The foundation stock was top Berkshire sows obtained in Canada which were mated to Landrace-Chester White crossbred boars secured from the United States Department of Agriculture. Starting in 1947, twelve years of selective breeding and testing included 258 sires and 840 dams - all highly selected for performance. All Lacombes that entered the herd after 1954 were backcrossed with purebred Berkshires and those that produced any pigs with black hair were discarded. This insured genetic purity for the white color, because in swine, the white color is dominant to black. From 1954-57, Lacombes were evaluated in 60 commercial Yorkshire herds in Alberta and proved to have the performance, capabilities and meat qualities that were sought. Lacombe boars were released to the public in 1957. The first sows were made available a year later. When released, the breed was estimated to carry 56 percent Landrace, 23 percent Berkshire and 21 percent Chester White blood. Lacombes were accepted for registration by the Canadian National Livestock Records in 1957, and in 1959, the Canadian Lacombe Breeders' Association was incorporated under the Livestock Pedigree Act. The Lacombe has been found very useful in central Canada, the area for which it was especially developed. Both boars and sows have earned a valued reputation for high fertility. The provinces of Manitoba, Saskatchewan and Alberta have especially accepted the breed where it is used straight or the boars used in crossbreeding programs. The crossbred sows have been found to be excellent in performance. Selection in the breed has been especially effective in producing sows reputed to be the most docile of the breeds in Canada. Sows stand confinement well and produce pigs that not only stand confinement but gain rapidly and efficiently with valued carcass characteristics. The Lacombe has been tested widely in Test Stations of Canada and has proven to be the fastest gaining of the breeds tested in feed efficiency and other measured performance characteristics, they showed up well and only slightly behind the highest in the various categories studied. 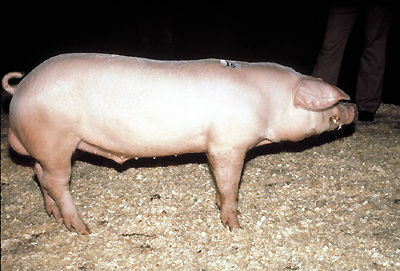 A Lacombe boar was the highest indexing sire tested in 1981. The breed has not only spread throughout Canada, but has also been exported to the United States, Japan, U.S.S.R., Mexico, Puerto Rico, Italy, Great Britain, West Germany and other countries. It is an excellent example of what can be accomplished by careful scientific breeding, rigid selection, and close attention to the details that makes a breed outstanding for production traits, carcass quality and profitability. This new breed, that was synthesized from three existing breeds that each carried certain desired characteristics, seems to be living up to the rigid requirements it was developed to meet. The number of independent breeders has been relatively small, but they have probably used production testing and performance records more effectively than the breeders of any swine in the world unless under direct and rigid government control. This care and attention to important details has resulted in continued improvement of the breed. Canada has long been known for the quality of pork produced. Their quality standards have been maintained at a sufficient level to meet exacting market standards while performance in the economic production traits have also been improved.